It has been decided that banks operating in the area should make available basic “no frill” accounts either with nil or very low minimum balance and to provide General Purpose Credit Card (GCC) facility without insistence of collateral, to enable hassle-free access to credit by rural households. Under the Financial Inclusion Plan, banks operating in the State were required to open Basic Savings Bank Deposit Accounts [BSBDA] with nil balance. Khariar is the nearest town and market place for Bikrampur which is at a distance of about 20 kms. At present there is no road to the village for which they take a footpath through the hilly terrain up to Manitritarai and from there they can go to Khariar by bicycle or by a four wheel vehicle. This year under MGNREGA, a road is under construction and after its completion,Bikrampur will be connected by all-weather motorable road. 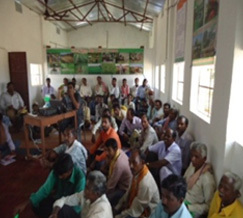 During the year 2010, Sahabhagi Vikash Abhiyan (SVA) motivated the villagers to make a Farmers club and take up collective action for the overall development of the villagers. Initially 25 men and 25 women became the members of the Club which was named Jai Shriram Farmers Club. At the beginning the members decided to create a savings fund so as to get rid of the private moneylenders who were exploiting the villagers at their time of need. Gradually all the families opened their bank accounts in State Bank of India, Khariar Branch. At present the farmers club has a community savings fund of 35,121 which they use to lend to the members at the time of their need.